The Problem: You’d like to buy a new digital camera for the holidays, but sorting through the piles of cameras at the local electronics store—all promising to be the next best thing—makes your head spin. With so many options, how do you choose? The Solution: Before you step into a store, you should know what your budget is (be sure to factor in the cost of a large memory card—most cameras don’t come with one), what type of camera model you want (a compact camera that fits in your pocket, or a larger, fuller-featured camera you can grow with), and about how many megapixels you want. We recommend getting 3 or 4 megapixels (at least) if you want standard 4-by-6-inch prints, and 4 or 5 megapixels if your camera lacks zoom features (so you can crop) or if you want to print at larger sizes. Just keep in mind that the more pixels you have, the more room those photos are going to take up on your hard drive. LCD Many of us use our camera’s LCD not only to review our shots but also to frame them. (In fact, many digital cameras forgo a traditional viewfinder altogether.) So make sure your camera’s LCD can keep up with the action. The colors should be saturated, the details should be sharp, and there shouldn’t be any delay or jerkiness in the image as you pan the camera. Rechargeable Batteries Some cameras come with single-use batteries, which means that you’ll have to lay out some more cash to get a set of rechargeables. If the camera does come with rechargeable batteries, ask to take a look at the battery charger. If the camera requires a dock and a power brick to recharge, keep in mind that you’ll have to take all of that gear along with you on your next vacation. Movie Mode Although not essential, a movie mode lets you go beyond still photos and catch small snippets of action. And it sure beats lugging around a video camera in addition to your digital camera. Some cameras limit the length of movies you can take. If you think you’ll take a lot of movies, look for a camera that captures full-frame movies (640 by 480 pixels) at 30 frames per second. This camera offers respectable images and an extensive help system at a great price. 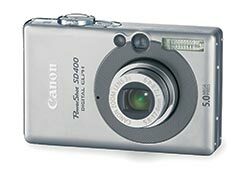 The 5-megapixel Canon PowerShot SD400 is 1.5 ounces lighter than the 7.1-megapixel SD500, but otherwise offers very similar features. Like its slightly larger sibling, the SD400 is a pocketable point-and-shooter that takes excellent pictures. Here’s an easy-to-use, feature-packed, 7.2-megapixel, point-and-shoot camera with a 3x optical zoom. Its photo quality was very good, but a couple of inconveniences prevent this small camera from being a big winner. The Coolpix S1 lacks some features enthusiasts might expect, but point-and-shooters who need a bit of guidance will like its easy operation and excellent color. 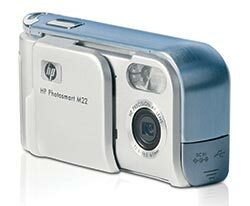 If you need a little handholding, the HP Photosmart M22 is an attractive camera, especially if you have a penchant for panoramas. 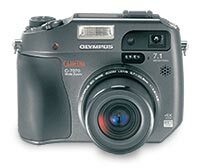 The 7-megapixel Olympus C-7070 Wide Zoom, with its namesake wide-angle lens, abundance of features, and great picture quality, has a lot to offer the enthusiast who’s a few dollars short of the price of a digital SLR. A great choice for the intermediate/advanced photograper, this 7-megapixel camera takes excellent pictures and an boasts an extensive list of features including RAW format capability, a live histogram, hot-shoe and a flip-out LCD. The Konica Minolta Dimage Z5 looks like a contraption from a sci-fi movie, but concealed within its quirky curves is a surprisingly capable camera with an Automatic mode for times when you need quick snapshots, and Program, Aperture Priority, Shutter Priority, and Manual exposure modes if you want to tweak controls. 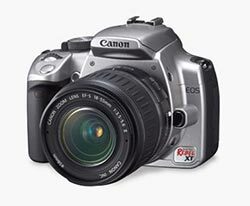 This camera’s feature set, image quality and price, combined with the vast assortment of available Canon mount lenses, make the Rebel XT the best choice so far in the sub-$1,000 digital-SLR market. If you’re trying to choose between Nikon and Canon D-SLR cameras, the D50 might not be such an obvious winner. But if you have been wanting to go digital but haven’t liked the high prices, the D50’s sub-$1,000 sticker should make it a slam-dunk. The Olympus Evolt E-300 is well-built and yields excellent images. However, you’ll get better high-ISO image quality from Canon and Nikon cameras and a better lens selection from just about any other camera manufacturer.